The majority of Americans do not have a choice when it comes to high-speed Internet. People living in rural areas have poor quality and coverage when it comes to even mid-range broadband, and America is lagging behind other countries in fiber optics. There are very few things in place that help address these problems, and big ISPs are asking the FCC to end one of them. But EFF is stepping in to ask the FCC to deny AT&T's and Verizon’s petition to give them a further chokehold on Internet access choice. On August 6, we filed a comment [pdf] opposing US Telecom’s (AT&T's and Verizon's trade association) petition for forbearance—the request that the FCC use its authority to repeal a key provision of the 1996 Telecommunications Act. Today, thanks to this provision, a new telecom company doesn’t have to raise the huge amounts of money needed to initially build its own infrastructure. Existing incumbent telecom companies are required to share their infrastructure at established, affordable rates with new competitors. This allows them to buy space on an existing infrastructure at an affordable rate. That lowers the barrier to compete with the big, established telecom companies. And, where the new companies appear, customers finally have a choice. They can pick between, say, AT&T’s policies and those of a smaller ISP like Sonic. Not only does that provide much-needed ISP competition, new ISPs make money with mid-level Internet access they get through existing copper lines (the FCC decided in 2005 not to extend these sharing rules to fiber). And then they can use that capital to spend on building high-speed infrastructure and build in rural areas that need more and better coverage. Small, local ISPs are also vital for rural areas. 39 percent of rural Americans lack access to middle-level Internet service. And where big ISPs leave a gap in the market through a lack of willingness to upgrade, new local ones can step in to fill the gap. As we pointed out in our comments to the FCC, small ISPs account for nearly half of fiber to the home deployment in the last few years. But if big ISPs can charge huge amounts for access to copper lines or simply cut off new competition altogether, we’ll lose the ISPs working to improve American infrastructure. The United States lags behind other countries on speed and coverage in a way that is embarrassing. 85 percent of Americans have no or only one choice (the local cable monopoly) when it comes to Internet speeds above 100 Mbps. Barely 10 percent of Americans have access to high-speed Internet through fiber optics. The European Union, meanwhile, is mostly on track [pdf] to meet goals of providing everyone with access to 30 Mbps Internet by 2020, with at least half of the EU being wired for 100 Mbps and higher. Almost everyone in South Korea has access to fiber. America is stuck at 85 percent of people having access to 25 Mbps. With their forbearance petition, big ISPs are seeking to end a requirement that creates competition and spurs better and faster Internet coverage. New ISPs use the guaranteed access to copper lines to get a foothold in a market and to build capital. And then it’s these local ISPs that build high-speed infrastructure and cover rural areas. These are two things not being done by big ISPs, who would have even less incentive to do anything if these local ISPs vanish. 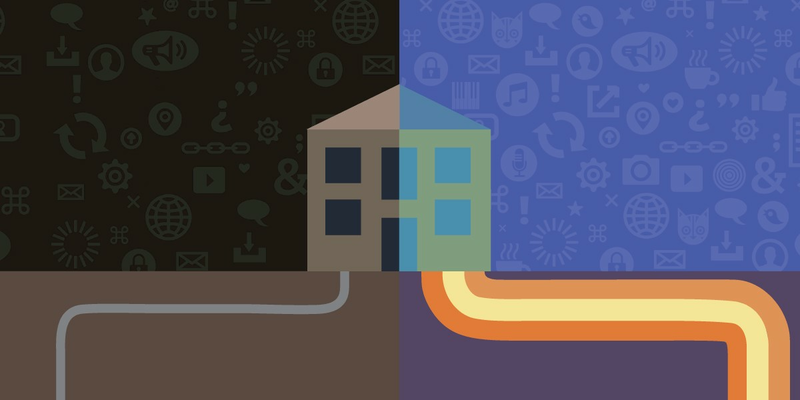 AT&T and Verizon know that we’ll all take bad Internet over no Internet. And that’s why EFF is asking the FCC to prevent big telecom from getting a chokehold on our Internet access.